I got a call yesterday from a woman named Natasha, who has chickens as pets regarding 50 hens urgently needing homes (obviously we don’t expect people to take 50. This is an urgent appeal. They are booked to go to butcher tomorrow, but if we can secure homes, the guy who owns them will keep them to end of weekend. These hens are about 3 years old, and have mostly stopped laying. The guy who has them, is wanting to sell them to his local butcher (Natasha is his neighbour). Obviously if we can get them good homes, and let them live out their natural lives that would be amazing. They don’t have much more time – 6 months to 2 years. He is wanting R 30 per hen. They will be safe from dogs, and not hounded by barking dogs at the edge of any enclosure. 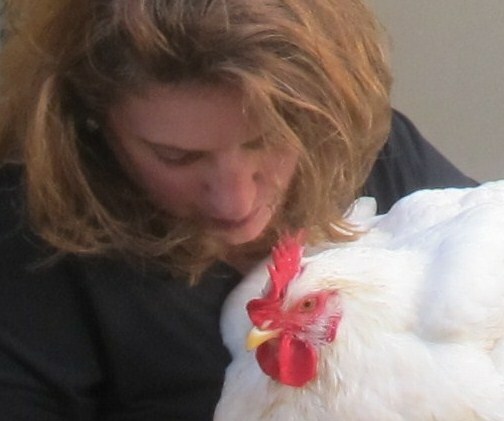 Should you at any stage not be in a position to still give these hens a home, you will contact chicken rescue and rehabilitation South Africa, so we can assist you with re homing your chicks. The hens will not be used for commercial gain –pet food, petting zoo, zoo etc. They will at no point be used as human food. 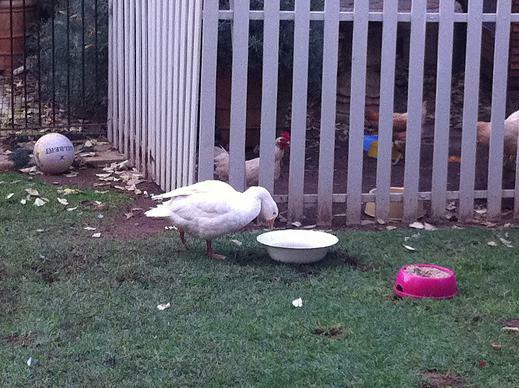 If you can assist us with a loving home for any of these girls – you can e mail me on candy@discoverymail.co.za. They will need to be collected this weekend from south of Jo’burg, Glenvista area. Yesterday I was phoned by a well known rescue organisation to say they had 4 hens (actually 1 is a rooster, possibly 2 of them), and a goose. Would I mind taking them. I arrived to fetch them. The chickens had food, and there was a very small amount of water which would have been fine for the chicks. The goose was a different story. Her leg was injured, there was no food for her, and the water dish was too small and shallow for her to get her bill in. I picked her up. She was very frightened, but seemed to like being in my arms. She was de hydrated, and her mouth was dry and smelly. This was distressing. I got them all back to my home, and immedietly gave Miss Goosey a large bowl of water and some mushy food to sift through. She immedietly drank and ate a little. Her leg was clearly very sore. It was late aftrenoon, and I felt her leg needed to be looked at sooner rather than later. I took her to mysister, a well known wildlife rehabilitator and bird expert. Her leg was not dislocated or broken, but very painful, and it seems a recent injury. Probably through mishandling in capture and transportation earlier that day to welfare organisation. Miss Goosey was very relaxed with us, and very tired. 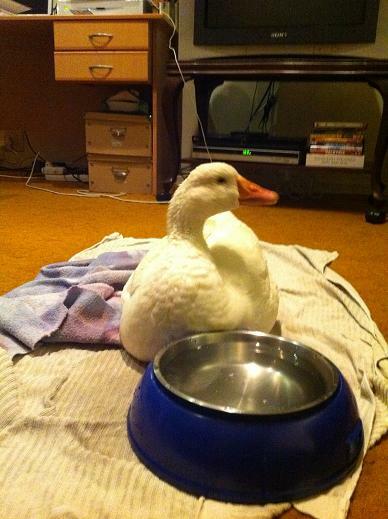 We settled her on a towel on the floor with food and water for examination. She talked to us constantly. 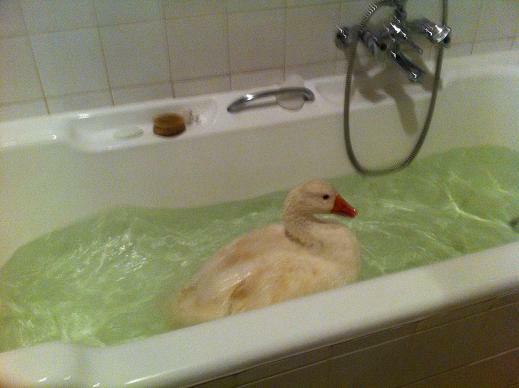 My sister then suggested a warmish bath for Miss Goosey. Nursing animals in the prescence of my sister with her compassion and vast experince is such a pleasure, and such an amazing growth opportunity. It was exactly what Miss Goosey needed. She stayed in for a good half hour preening, relaxing, getting water on her feathers, talking constantly, playing. Her leg was defnitely a little less sore post bath, but she was tired. We made a doughnut of towels for her to keep weight off leg, and she went to sleep. This is very valuable nursing for water birds. I started getting sad and angry later in the evening. This was clearly a loved pet, handed over to a welfare organisation for care for whatever reason. In one day this organisation (who does do good work), managed to hurt her leg, dehydrate her, and deny her food. It would have taken one minute to fill a tub with water for her, and put some dog food mixed with warm water down for her. To handle her a little less roughly. It was not necessary for Miss Goosey to have such an unpleasant experience. We now go about finding a good free range home for her with some other geese. The 4 chickens are doing well, although the one has a big wound on neck – it looks quite grim, and seems to have some sort of fungus around it. A trip to our vet seems like the best option!